So you just finished your book. Congratulations! No doubt about it – you’ve spent hours, days, weeks and months to complete it. And it’s a masterpiece. Now it’s time to sell it, make that New York Times Best Seller’s list and retire. But you’ll not likely retire on the revenue from book sales alone. In fact, your book is probably more useful as a business card or entry-point into a sales funnel rather than a profit driver by itself. Here’s why. Ever heard of “price anchoring”? Price anchoring a psychological bias that causes us to rely too heavily on existing information when trying to make a purchase decision . Clever marketers use it all around you to convince you that you’re getting a good deal. Let’s say you are looking at a product that usually sells for $1000, but today it’s 80% off. You think this is a great deal because in your mind you’ve anchored the price at $1000. The discounted $200 price is a steal in comparison, but what you may not realise is that the business will probably make a hefty profit even at the discounted price. So what’s the lesson here? There is a disconnect between the actual value of an item and the perceived value of an item. In the case of a book, the “anchor” price of the book is what the market typically pays for books. 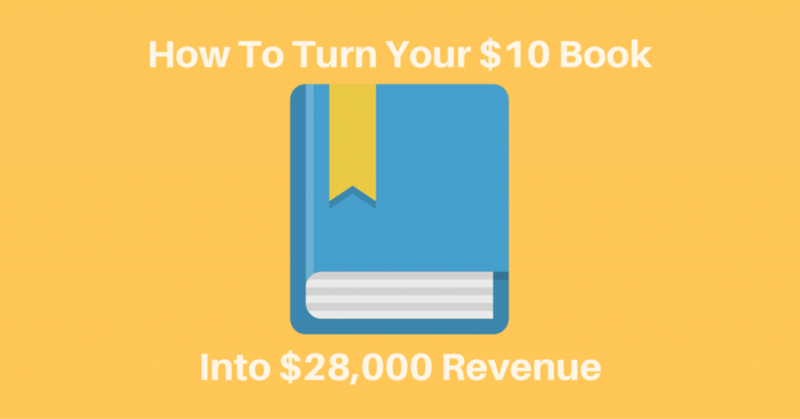 Books are commoditised at around $10 apiece, which means you are hitting a ceiling with the sales price even if the value and advice in your book can help someone to make $10,000,000. For the most part, that same book is still worth only $10 in its book form when it comes time to pull out the credit card. Try to charge $500 for it and no-one will buy it because it is “too expensive”. So whilst your book can then act as a reputation or authority builder, it’s generally not going to make you much by itself. Unless it’s not a book anymore. In this video I will show you a quick methodology for turning your book into a training course and complementary products. When combined with an effective sales funnel strategy these items can NET you $28,000 with very little additional effort. You’ve already done all the hard work – researching, writing, editing and publishing. All you need to do now is change the way your book is packaged and presented to the market. Have a look at the video below to learn how. Great Video. Thanks for sharing. Have me a few ideas immediately as I’m finalizing a book project right now.